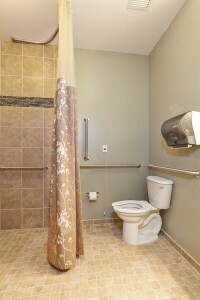 Clear Creek Nursing & Rehabilitation Center offers 40 private rooms and 40 semi-private rooms (shown above). Our rooms have been beautifully finished with laminate wood floors, and include flat screen TVs, wireless internet and bathrooms with ceramic tile showers. Built-in cabinets provide a secure place to store personal belongings. Private rooms include a loveseat and rocking chair. 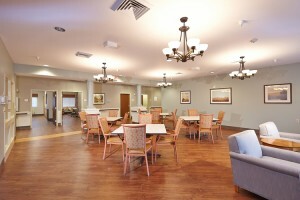 Clear Creek Nursing & Rehabilitation has been designed to offer a home-like environment to our residents and families. Included within the facility are seven family rooms with fireplaces where families and residents can gather to socialize or watch TV. The community also includes a game room, coffee shop and chapel as well as a spacious community room for larger events and activities. Clear Creek Nursing and Rehabilitation Center is proud to be a Smoke Free campus. We offer nutritious restaurant-style meals. Our Activities Department knows that every day is a day to be celebrated, and we do just that! Throughout the month there are opportunities to join a painting group, enjoy the sounds of numerous musical talents, play Bingo and a variety of other games, or even try something new such as belly-dancing or Yoga. Regular meetings are held with our residents to voice exactly what they would like to have scheduled, and our calendar brings these ideas to reality. Outings to community events, sporting venues and local eateries are available to ensure that everyone maintains this important connection to the broader community.